Kai, a blue ninja with a staff(pictured above); Tengu, with the accompanying long nosed mask; Coyote, a yellow coyote, I guess; and Blunet, the only woman, and the only one that's visibly, seemingly, human. Which punches or kicks are stronger seem dependent on which character you're playing as. With some exceptions, every punch and kick can be combined with Up for high strikes, and Down for low strikes, which can be worked however the player wants into their combos(one example of an exception is that Tengu doesn't have a high Punch 2). Hold away, when being attacked, to block. 3, 1/2/4/5 jump attacks. 3, Down & 1/4 dive attacks. Away & 3 will escape. Holding forward when pressing 1/4, when extremely close, throws. Tengu & Blunet have alternate throws with 2/5. 1 punch and 1 kick button pressed simultaneously will perform the super attack, which requires you have at least one scroll. Each life comes with one, and every time you continue without having used one, it adds to your count. Any attack button will pick up items. Kai has tapping 1 repeatedly. Kai and Tengu have away, away/Down, Down, Down/forward, forward & 1/4. Tengu, Coyote, and Blunet have forward & 1/4. Tengu & Coyote have Down, Up & 1/4 when extremely close. Blunet has away, away/Down, Down, Down/forward, forward & 2/5. Possession has it's quirks. For starters, each enemy has their own special move. That special move is explained to the player in game, the first time they possess a specific enemy type. Possessing an enemy does not count as having beaten enough enemies to move forward, and the game will just replace the enemy you just possessed with another. Possessed enemies also don't have the same range of attacks as the main playable characters. If you're reduced to almost 0 health, you'll be forced back to the main playable character. Otherwise, press 6 again to give up the possession, and play as the main character again. Bonus stages pit the player, in possessed enemy form, and another of the playable cast(most likely both players in multiplayer mode) against one another for scrolls. If the player loses in single player mode, they lose all the scrolls they have, whereas they only win 1 or 2 otherwise, along with some points. You can choose your first stage, from 3, and the game explains the path you'll take with each one. Unfortunately, the game has it's share of flaws. 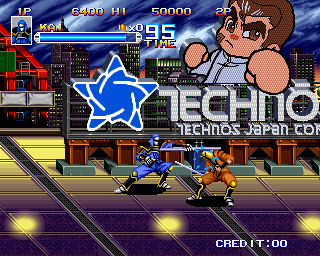 For starters, it borrows more than some controls from fighting games, as enemies will only come at you one at a time. This also forces you to lock onto an enemy, so you have no free movement when enemies are around. As cool as the possession technique is, none of the enemy characters have the level of skill the main characters do, so you're more often than not better off sticking to the main characters. Finally, in single player mode, you can get a bad ending simply by not winning what would otherwise be a bonus round, at the very end of the game, after you've already beaten the final boss. BigDarsh has pointed out that there's a good difference in the revision which has now become the parent rom in the latest version of M.A.M.E. 1 & 2 now possess your enemies, and I have no idea how to use the scroll specials, since that used to be it, and no other button combinations seem to work. Everything else remains the same, you just have 1 less kick and punch, and no dedicated possession button. If you prefer the 6 button scheme, you'll now want the reduced (US, Version 2) to go with the new parent rom. » How do you remove Shadow Topics?